Note: These photos are mostly contemporary, i.e. taken after the BNSF merger. 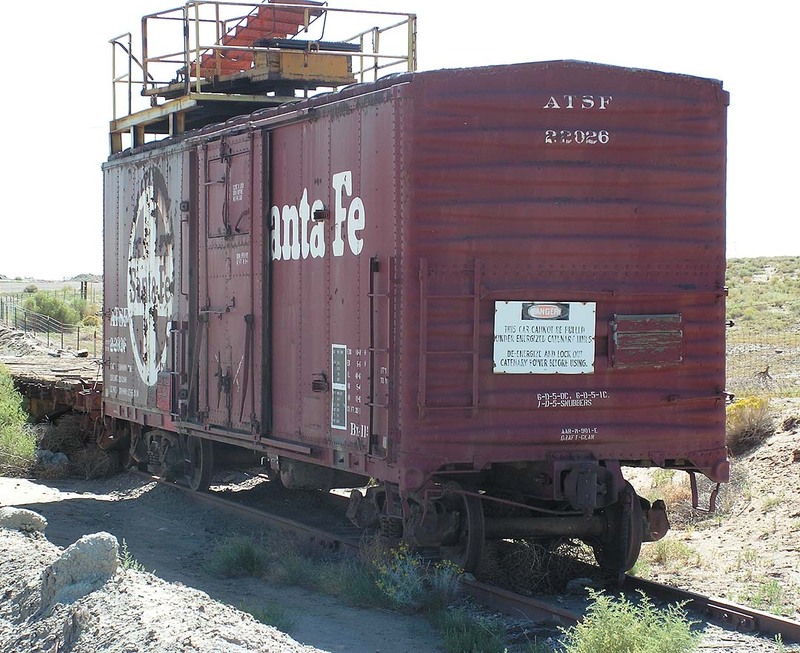 Autorack riding on ETTX , north of Alamogordo on 2/18/2008. This Union Pacific autorack train was headed east on the Golden State route with an ex-SP SD40M in the consist. The rack is in decent shape considering its age. Autorack riding on ETTX 852511, same train as above (2/18/2008). The taggers have gotten to this one. Covered hopper 312910, from P-S, seen in Longmont, CO on 7/31/2011. 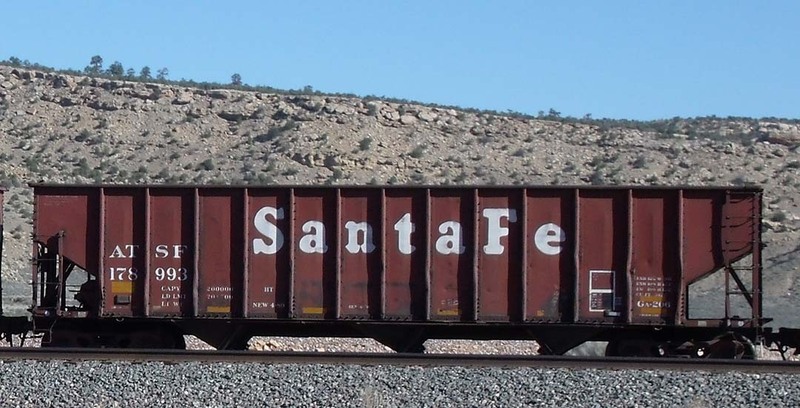 The original Santa Fe herald is barely visible through the overpaint. 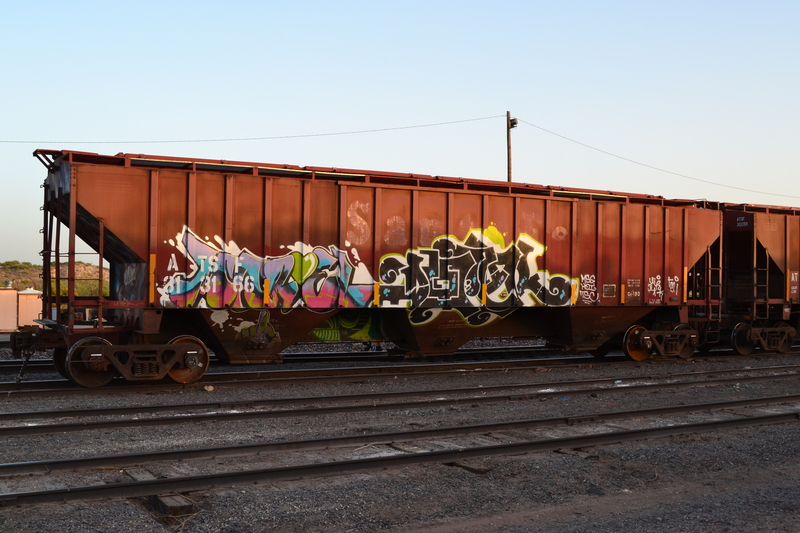 Faded and heavily-tagged hopper 313166, parked in Rincon (5/06/2016). 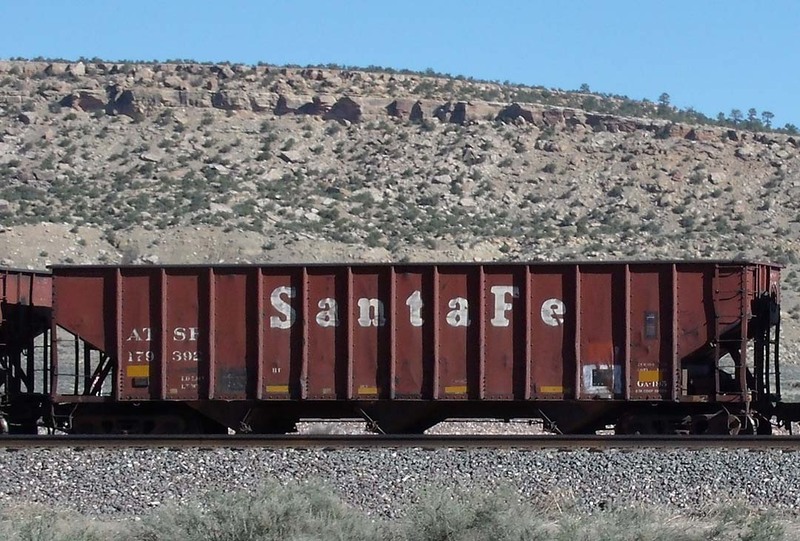 Covered hopper 313809, from ACF, parked in Rincon, NM on 5/09/2010. Covered hopper 315235, at Rincon on 10/14/2013. Built by P-S, April 1975. 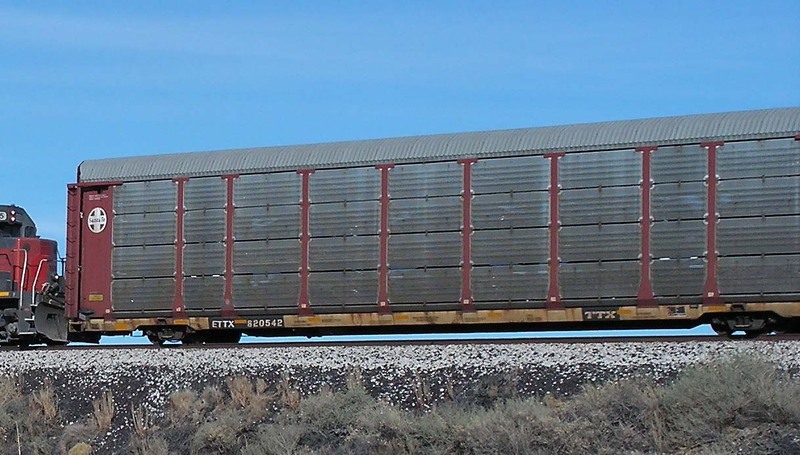 4750 cu ft Covered hopper 315775, at Rincon on 7/27/2014. 100-ton triple hopper (open) 178571. It’s being switched around in Gallup on 4/22/2012. The taggers have found this one, unfortunately. 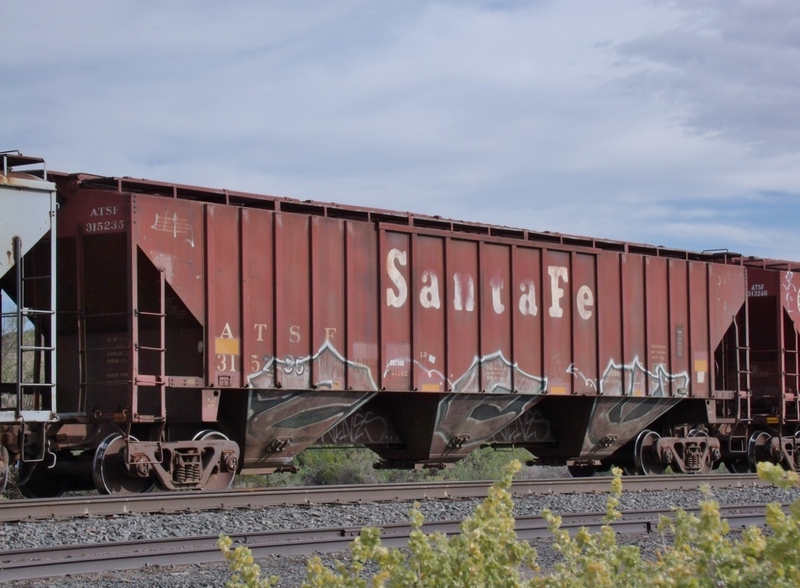 100-ton triple hopper (open) 178573, on a house track a few miles west of Gallup (4/22/2012). 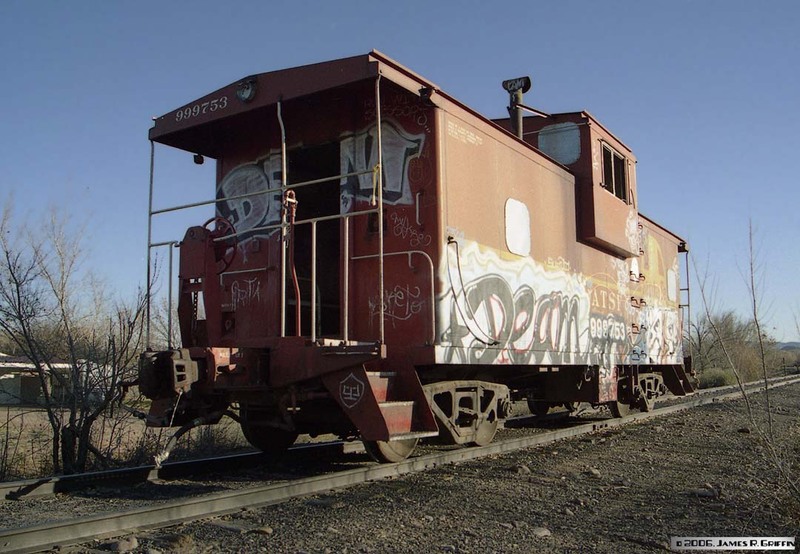 100-ton triple hopper (open) 178993, on a house track a few miles west of Gallup (4/22/2012). 100-ton triple hopper (open) 179392, on a house track a few miles west of Gallup (4/22/2012). 60-foot box 625446, on a northbound NAFTA train at Rincon on 5/08/2016. This car still shows remnants of its ATSF herald and “Shock Control” logo. The marks and number have been repainted. Graffiti obscures much of the other stenciling, unfortunately. 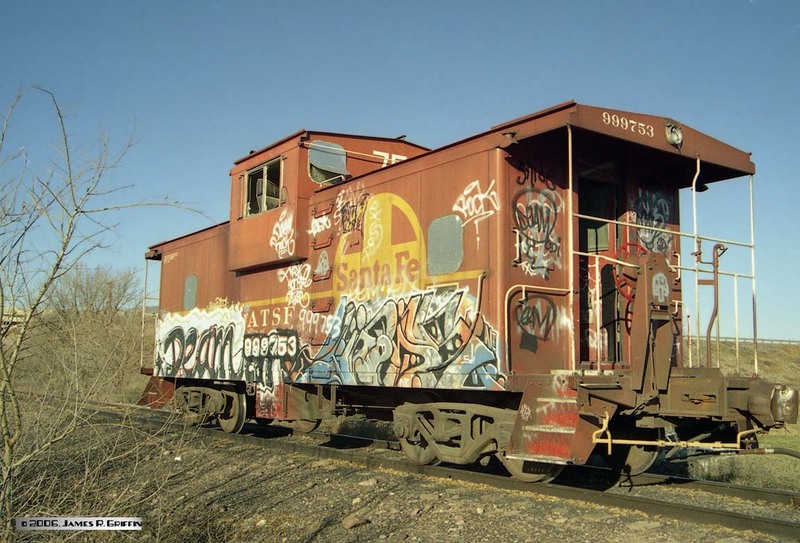 This ancient 40-foot boxcar, No. 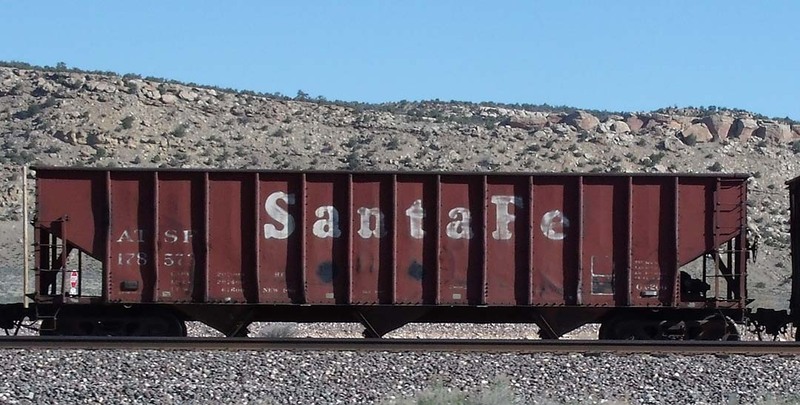 , is now on the Navajo Mine railway, and has been modified for use as a catenary-maintenance car (the mine RR is electric). It’s been at the mine since the 1980’s, perhaps longer. 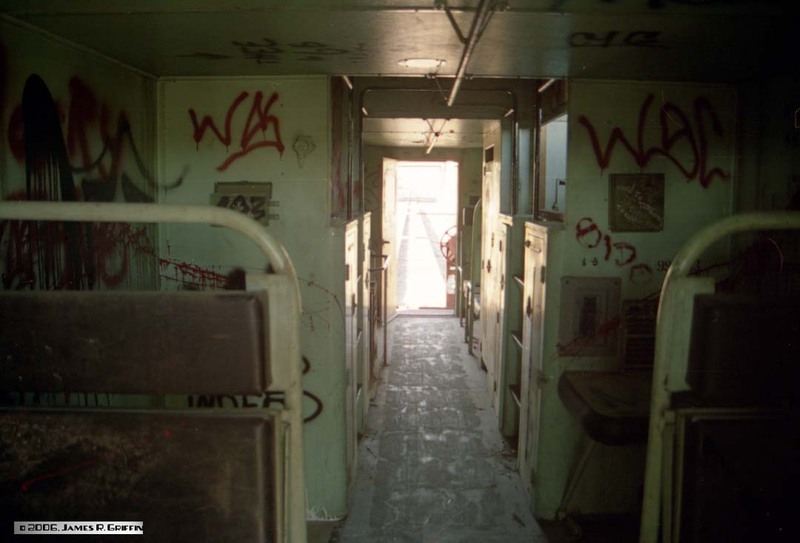 It still carries all its ATSF markings except for a New or Built date, which may be hidden behind the partially-opened door. Friction-bearing trucks. 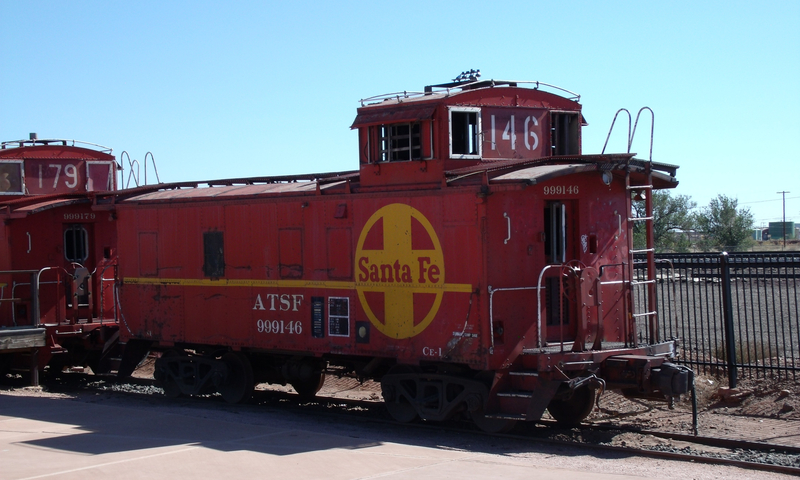 ATSF Caboose No. 999753. 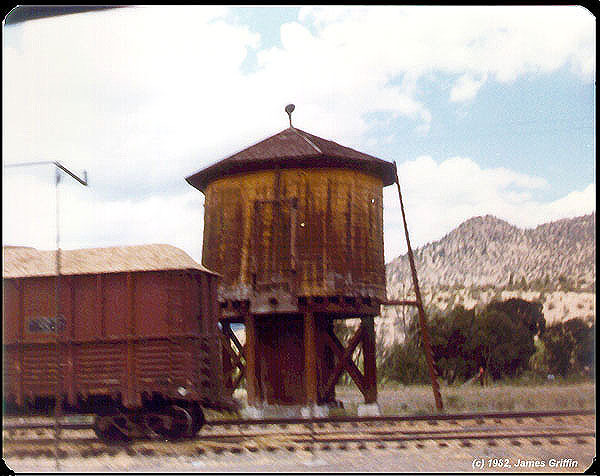 This cab is kept at Socorro, NM for use as a shoving platform when switching the Dicaperl Minerals spur. The car has been there for quite a while and is not protected in any way I could see. Obviously the local taggers find it an easy mark. Top: 3/4 view from the “lit” side (12/04/2006). Note the side ladder. Car built by International Car in the mid-1970s. Note that basically all windows are covered in sheet metal. Middle: From down-sun, we see the opposite end. The car is usually left on the tail of the wye, which is also the beginning of the spur track leading into town. Bottom: Interior view. The car is not locked or even closed, so I assume that nothing of value is stored (or attached) within. 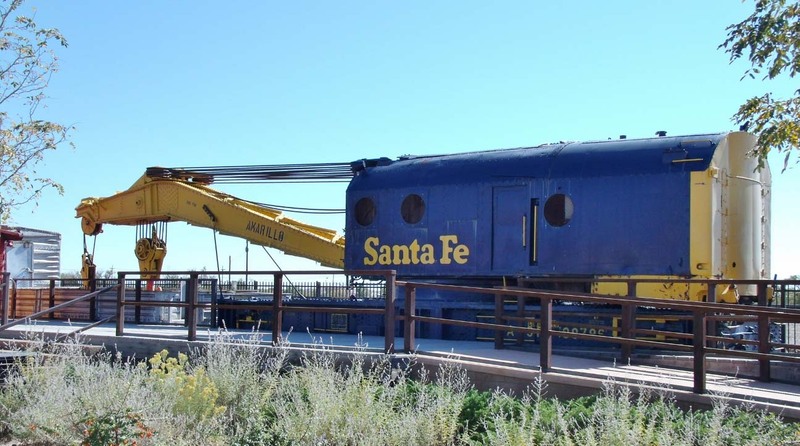 There are two cabooses displayed at the small railroad park in Winslow, AZ. 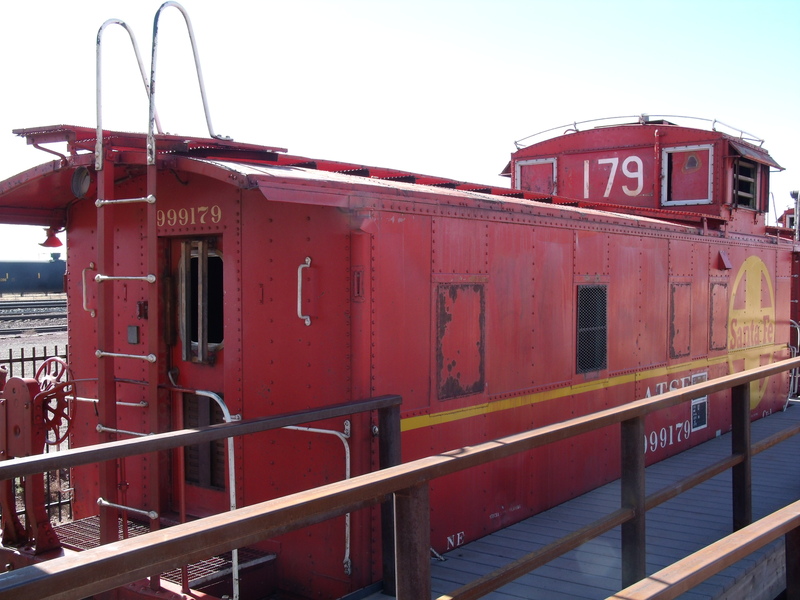 Here, caboose 999146 is seen from the cupola end. The other caboose, 999179, has a platform built right up to it. There’s not enough room on the sunny side to get a decent photo. Water car 189228, parked at Rincon on 2/19/2007. Stencils say “Domestic Water”. 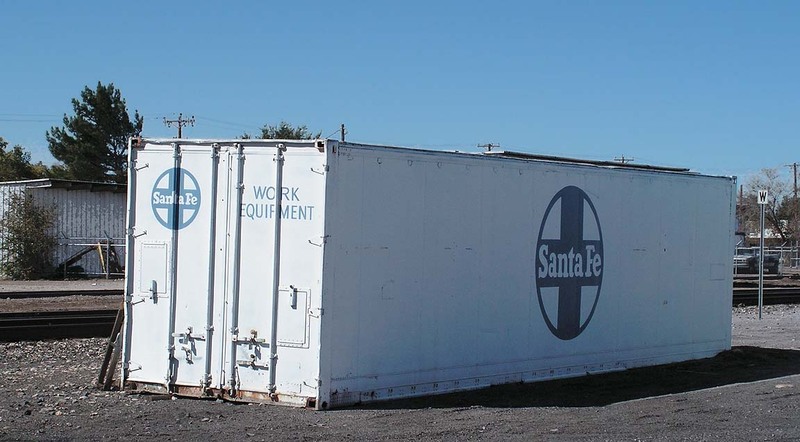 This container has been set on the ground and is now used as a storage shed in Las Cruces, NM (technically, Mesilla Park). It’s a standard 40-foot box, but all revenue markings have been painted over. Photo taken 11/1/2009. 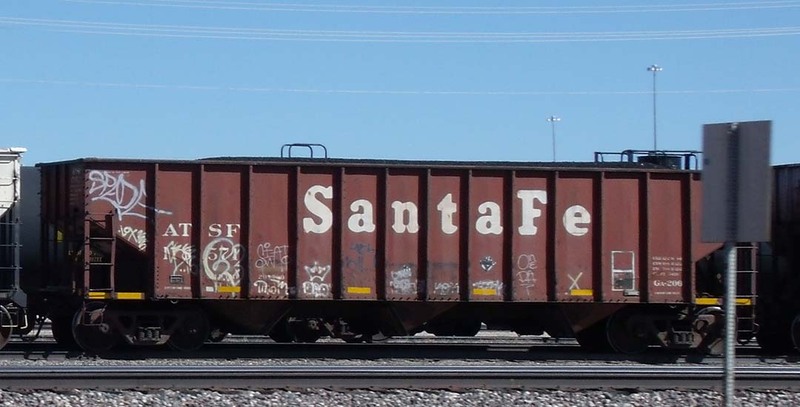 Santa Fe’s Amarillo derrick No. 199796, now stored at Winslow (condemned and stricken from roster). 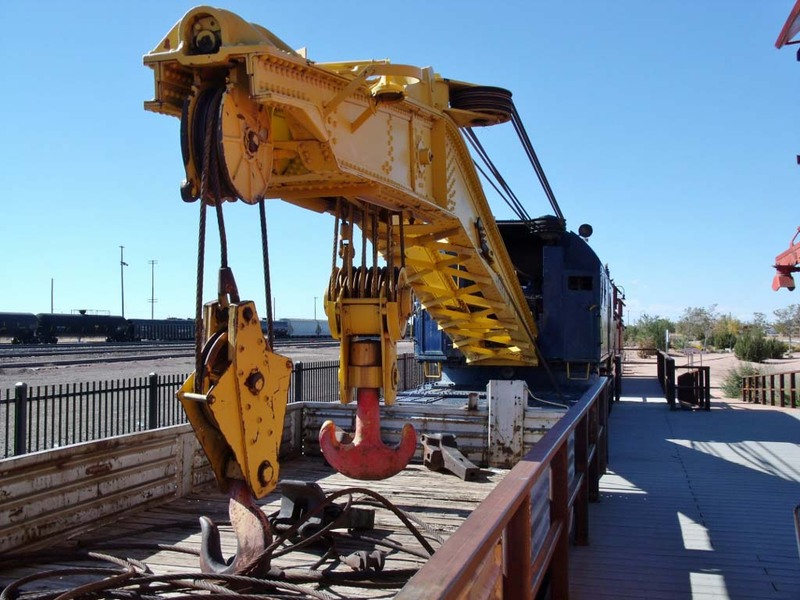 This is a 200-ton derrick, retired circa 1990. A small boom/tender car is also stored with the crane.The city has created a small park here and built a platform alongside the derrick and the three cabooses parked there. It’s a great place to watch trains without having to worry about ROW’s and sketchy neighborhoods. Too bad the light is on the wrong side for good photos.